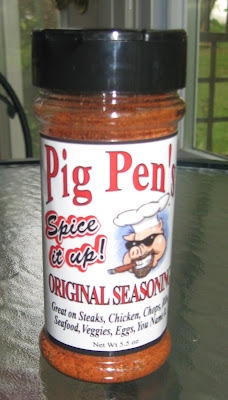 I have been in a "trying new barbecue stuff" mood lately, and so I grabbed some Pig Pen's at Food Lion. It was with the barbecue sauces and rubs, and since it was dry, I figured it was a barbecue rub. WRONG! Well, it turned out way right. There are times when not being able to see that well comes in handy. This was one of those times. Other times it does not work out so well, so I am trying to learn to use my progressive bifocal glasses, although they make me seasick and walk geeky. 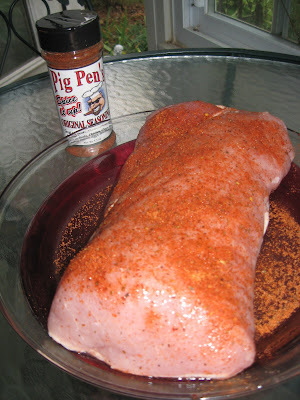 I brought home Pig Pen's Original Seasoning and lathered up my pork loin. Those pork loins were on sale this week at Food Lion, and it's hard to pass up pork loin which is fabulous slow cooked on a grill. When I opend up the seal on Pig Pen's, I noticed right off that it had a zip. That's fine by me, but my younger son does not like foods too hot, so I went easy on the rub on the pork loin. That pork loin was smelling like heaven as it was cooking, and my mouth was watering. It takes a while to slow cook a loin, so the kid and I were getting quite hungry, but good food is worth waiting for - and this was massive pork loin. That pork loin was some of the best I've had. The Pig Pen's gave it just enough zip to make it stand out big times. So, then, I had to round up my reading glasses and get a handle on this new and fabulous grilling rub. Well, the joke was on me. Pig Pen's is really a seasoning sprikle kind of like a seasoning salt but zestier. The other joke is that the guy who makes this lives right in my home town. How random! I don't know any guy who goes by Pig Pen, so I am going to have to ask around. This is not a big area. It can't be that hard to find the Pig Pen guy. In the meantime, I will continue to use Pig Pen's Original as a barbecue rub but also as a sprinkle as intended for all kinds of foods - really anything that you might hit with seasoning salt of some type. Yum! I am tempted to go get another slice of that pork loin with Pig Pen's, but I just came off that winter Consumers Digest grill project where I put on 10 pounds or so. I dropped that (or most of it), so I will hold myself back. But, I can tell you that was sure a good loin. Your post is entertaining to read and to the point. Thank you for writing all this infomation Cyndi. We will share the blog with the class. Good job. That will spice things up alittle. Holen One Farms Dipping and Glazing Sauce - Yum!